Welcome to the Tinmith project! 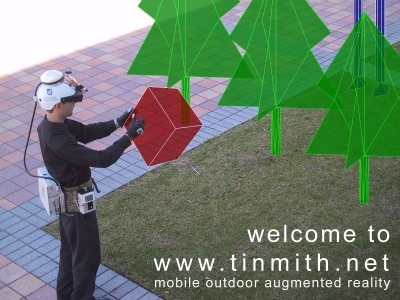 This is the official web site for the Tinmith project, demonstrating our research into mobile outdoor augmented reality. 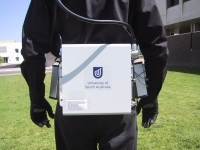 This project is part of the Wearable Computer Lab at the School of Computer and Information Science, University of South Australia. The project was operated by Dr Wayne Piekarski from 1998 to 2006. Augmented reality (AR) is the registration of projected computer-generated images over a user’s view of the physical world. With this extra information presented to the user, the physical world can be enhanced or augmented beyond the user’s normal experience. The addition of information that is spatially located relative to the user can help to improve their understanding of it. The images and videos on this web site are demonstrations of what a person experiences when they use our equipment. In 2006 we were proud to announce our latest hardware design which is lightweight, robust, and with the most powerful graphics and CPU available. We have combined the best components available to produce a system which is worn on a belt instead of a backpack. We have been developing these AR systems since 1998. Our first backpack systems were large, fragile, bulky, and showed primitive images due to the technology available. With the latest technology, everything has improved significantly and there are a number of exciting applications for AR technology such as for military simulation, mining, agriculture, and entertainment. Please visit the backpack page for information about our current and previous backpack systems. 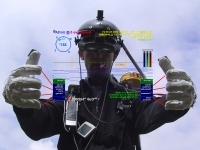 Tinmith is based on a flexible software architecture which is designed to support the rapid development of outdoor augmented reality applications. We have built prototype systems that have been used for mining visualisation, military simulation, agriculture visualisation, and entertainment. 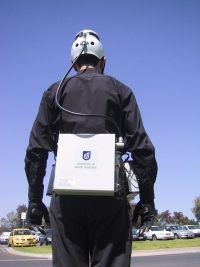 The Tinmith software is available for licensing in either binary or source form, and either separately or as part of a purchase of a Tinmith backpack system for a complete package. The Tinmith software has undergone a number of evolutions since 1998. Versions 1-4 were written in C, Evolution 5 was written in C++ and forms the basis for our current work, while the latest release is numbered by year 2006 and implements a number of new features. For more information about the software please visit the software architecture page on this web site. Please visit our demos page for photos and videos that showcase a number of our outdoor Tinmith applications. 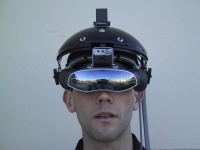 The HOG3D project is designed to allow users indoors to teleport 3D objects and hand gestures to outdoor Tinmith users. Users can use what we term 'god-like techniques' to communicate with people outdoors. Please visit www.hog3d.net for more information about this exciting new project. The ARQuake page contains info on how we modified the iD software version of Quake to work on a mobile AR computer (as seen in a Slashdot posting about us, and at Campus Party 2002 in Valencia, Spain). Using a GPS, orientation sensor, and a plastic gun, users can walk around in an outdoor environment playing Quake. The original system has been majorly rewritten so that it uses the latest Tinmith hardware and software, and we have a number of videos and pictures showing the system in action. 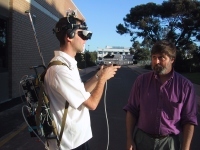 The Wearable Computer Lab is currently directed by Prof Bruce Thomas, and was also directed by Dr Wayne Piekarski until 2006. The WCL is where the Tinmith project was born and developed from 1998 onwards. Visit the lab home page for more information. 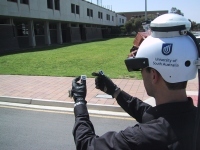 As part of the PhD research work of Dr Wayne Piekarski and other students, a number of academic papers have been written about the system, user interfaces, and techniques used for many aspects of the system. These papers describe in detail much of the work that has been performed for this project. See Wayne's thesis for an in-depth review and discussion of all the work performed up until 2004. The thesis contains a detailed overview of augmented reality technology if you are interested in learning about the state of the art in the field. If you would like further information about anything on this web site, or if you are a member of the media/press and would like to publish photos and/or videos from this web site, please contact Wayne Piekarski, the Tinmith project leader. Many of the images and videos on this site have been presented at a reduced resolution and are available at a higher quality on request.